"The scope of the theft is almost unfathomable." So was the 2004 Presidential election really stolen? And are you hopelessly naive or a Bush Administration shill if you're not absolutely convinced that it was? That's sort of the central question posed by Uncounted, one in a continuing series of left-leaning documentaries more interested in advancing a political agenda than in making a good movie. (See, for instance, here, here and here.) And in the absence of first-rate documentary storytelling, we're left with little more than a grab bag of conspiracy theories and shadowy intimations of Rovian shenanigans, a movie that practically defines preaching to the choir, and doesn't really seal the deal. Of course what's being talked about here is fundamental to our democracy, and the disenfranchisement of any citizens, particularly those of color or from lower socioeconomic strata, threatens the very tenets of our constitutional system. The horror stories are ample: fifteen-hour waits to vote in some places in Ohio in 2004, for instance, due in large part to the allocation of voting machines, as determined by a Republican bureaucracy; undervotes, miscounted votes, discarded votes, a queasy sense that somebody is trying to steal something. Director David Earnhardt doesn't pass up the opportunity to revisit Florida 2000, so we can become reacquainted with charming old friends like Katherine Harris; if eight years out he thinks he's going to change any minds, he's probably wrong, but the real scandal, certainly, is how little has been done to rectify the situation. The real villain of the piece is the Diebold Corporation, one of the principal manufacturers of electronic voting machines—their products can be easily manipulated, implanted with viruses, made to make votes disappear, or tally more votes than were actually cast, and all without a paper trail. (There are a handful of canny points tucked away in this documentary#8212one is that Diebold's other principal business is the manufacturing of ATMs, so the notion that the company is incapable of producing a machine that generates a paper record of an electronic transaction is laughable on its face.) Some leaked documents from Diebold are the most damning things here, but after a while, the film starts hopscotching around the country, giving us appalling anecdotes of electoral malfeasance. We're supposed to conclude that there's a pattern, but as many have said before me, anecdotes isn't the same thing as data, and we're still waiting for a smoking gun. You sense that Earnhardt sort of knows that he doesn't have the goods, so we get lots of ominous music, intimations of bad things happening behind closed doors, and outraged citizen-journalists who just know that something's amiss�but neither they nor the director gets at precisely what, and factoids in white text popping up on a black screen aren't an appropriate substitute. The film is also an unintentional reminder of how quickly time passes in our media age, as many of the news clips feature familiar faces who have passed on (Peter Jennings, Tim Russert) or those who simply no longer clog up the airwaves (Aaron Brown). The call to action is a worthy one, and the closing credit sequence owes an obvious debt to An Inconvenient Truth, but ultimately this documentary sheds more heat than light on the problems with our electoral system. Image Transfer Review: Kind of a blotchy transfer; some of the news footage from 2000 and 2004 looks unbelievably ancient and degraded, like a cheap video camera was pointed at an old monitor running YouTube clips. Audio Transfer Review: Dynamics are limited, but the audio is generally clear; there's an overabundance of the obligatory sinister music whenever rogue operatives appear on screen. Extras Review: Eight deleted scenes emphasize the hopefulness of citizen activists like Bev Harris and her group, Black Box Voting, while sticking it to the 2004 Kerry campaign and its unwillingness to put up a better fight, especially in Ohio. And twenty extended interviews and speeches feature faces familiar from the feature, covering a fair amount of the same material. Also, it seems like a bit of logrolling that one of the talking heads, Brad Friedman of bradblog.com, also provides a pull quote that appears on the back of the DVD case. 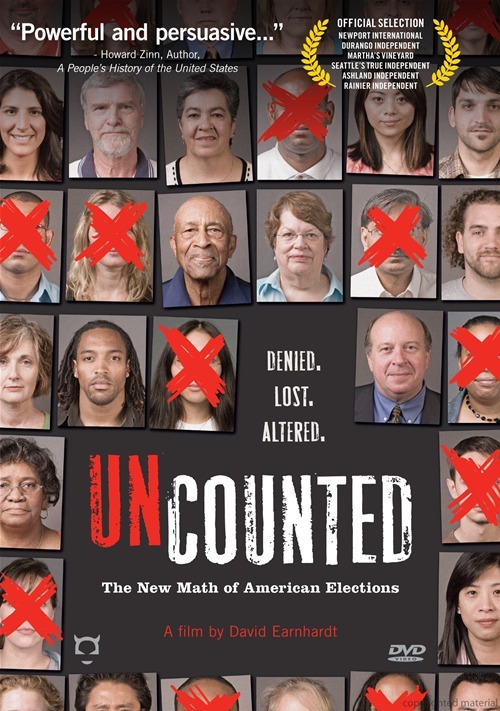 Elections are messy, and electronic voting provides a uniquely sinister opportunity for the forces of darkness to corrupt the electoral process, but this documentary doesn't make a persuasive case or a compelling call to action. Unfortunately it's content simply to string together some admittedly outrageous anecdotes with a parade of low-rent conservative rogues, but there's not a lot of rigor to this project.